A sell-out audience of over 3,000 people from all over Ireland, the UK and further afield attended an epic performance of Handel’s Messiah on Saturday last at the Knock Basilica. In attendance were both His Excellency Archbishop Jude Thaddeus Okolo, Papal Nuncio and the Most Rev Michael Neary DD, Archbishop of Tuam. The trumpet did indeed sound with the Basilica’s inaugural performance of this, the world’s most famous and beloved oratorio, renowned for stunning choruses and arias. Following last year’s sell-out performance of the Concert for Peace, presented by the Mayo International Choral Festival and attended by the President of Ireland Michael D. Higgins and Sabina Higgins, Knock Basilica saw the return of the RTÉ Concert Orchestra to present the inaugural performance of this iconic piece at the Shrine. This was a sensational evening of delightful and thrilling music making as Conductor Proinnsías Ó Duinn led a 180-strong choir which saw two of the best choirs in Ireland, Mayo’s own multi award- winning Cór Mhaigh Eo and the Ballina Chamber Choir join forces with the Dublin based Our Lady’s Choral Society. This was complimented by an incomparable line up of international soloists, Soprano Claudia Boyle, Tenor Julian Hubbard, Alto Anne Marie Gibbons and Bass Christopher Cull . 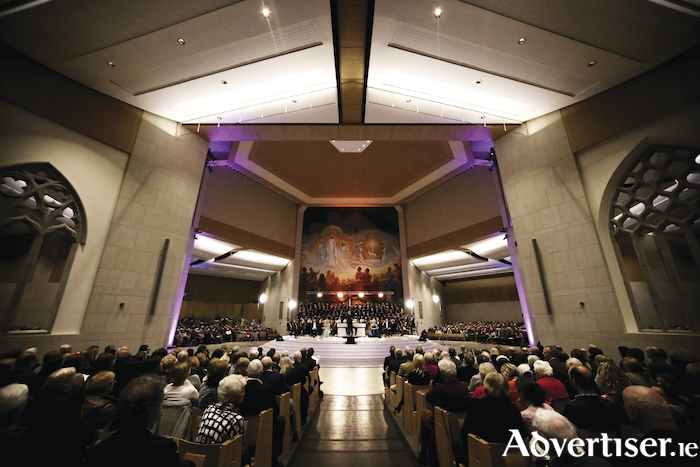 Overflowing with the most exciting choral writing, thundering timpani and blazing trumpets, and in the true spirit of the piece, the Messiah saw a packed Basilica all rise to their feet for the universally recognised ‘Hallelujah Chorus’. Speaking following the performance a delighted Fr. Richard Gibbons P.P. , Rector, Knock Shrine said ‘this is the culmination of 11 months of careful planning by many people in many areas. I would like to thank not only the Knock Shrine Staff and Volunteers but also the many individuals and local businesses who have contributed to the success of the evening.’ The concert, presented by Liz Nolan, was recorded and will be broadcast on Christmas Day at 1pm on RTÉ Lyric FM.